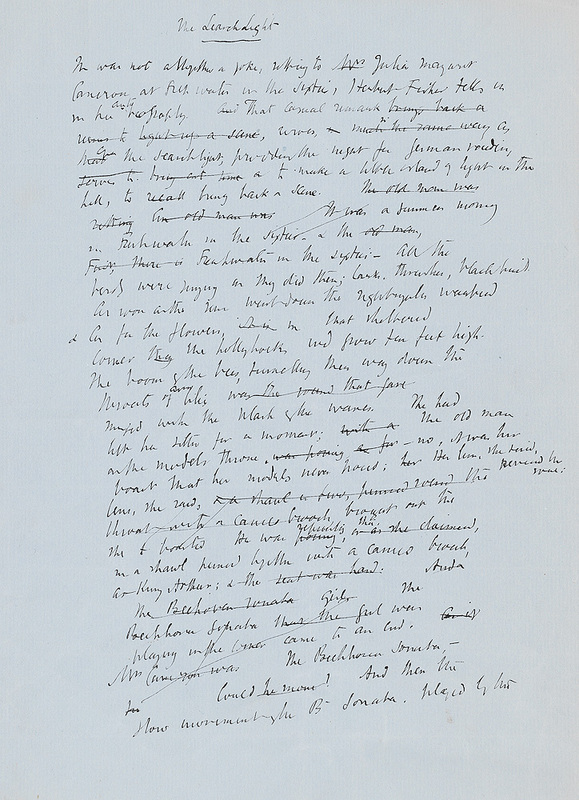 This is the first of the “Freshwater” drafts of Woolf’s short story, “The Searchlight,” written in 1941. 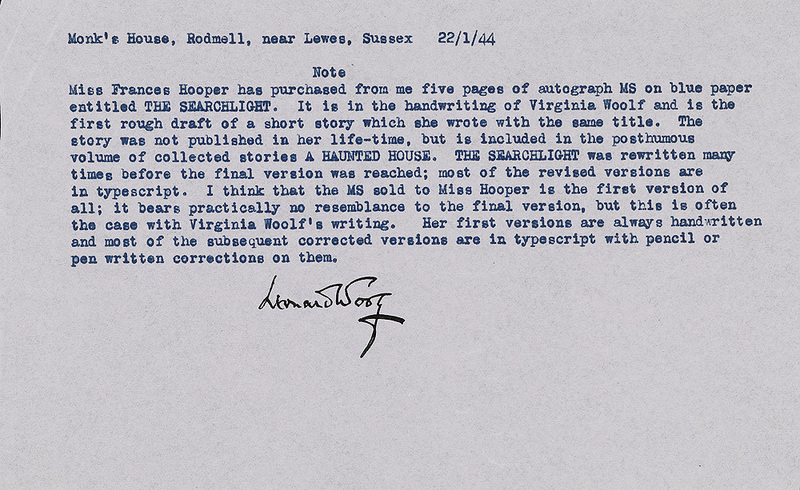 Frances Hooper purchased the holograph from Leonard Woolf for $125 in 1944. 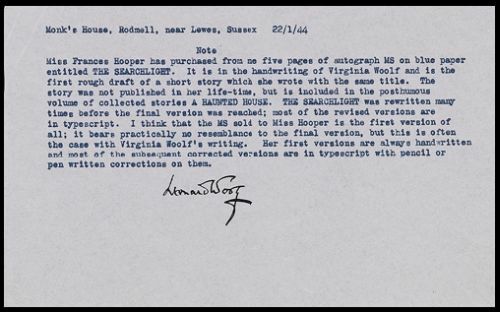 There is a 1939 corrected typescript of “The Searchlight” in the Virginia Woolf Papers at Smith College, donated by Ann Safford Mandel ’53. Thirteen additional drafts of this short story, ranging in date from 1929 to 1941, are known to scholars. Virginia Woolf. “The Searchlight”: holograph, . In 1939, Woolf wrote in her diary that she had written “the old Henry Taylor story that's been humming in my mind these 10 years” as a relief from her work on the biography of Roger Fry. Sir Henry Taylor worked in the Colonial Office under Woolf's grandfather, Sir James Stephen, and was a close friend of the photographer Julia Margaret Cameron. The central incident of the story involves Taylor looking through a telescope from a tower at Witton-le-Wear, where he was isolated as a child. In the “Freshwater” version of the story, Taylor is posing for Julia Margaret Cameron as King Arthur, and later recounts his story of the telescope for another house guest as they stroll on Freshwater Down. Leonard Woolf. Signed typed note to Frances Hooper, 22 January 1944.